Cases of hemorrhagic fever were reported in an area of Congo that is facing an Ebola epidemic as far back as December and the first deaths were reported in January, a spokesman for the WHO said in the capital Kinshasa on Thursday. The health ministry said on Tuesday that at least 17 people had died in an area of northwestern Democratic Republic of Congo where health officials have now confirmed an outbreak of Ebola. “According to our early information, the cases have been reported since December and the first deaths were reported in January, but the link between the deaths and the epidemic has not yet been established,” WHO Congo spokesman Eugene Kabambi told Reuters. Health officials said on Wednesday that 17 people have died in the north-west of the DRC. It is the ninth time Ebola has been recorded in the DRC, whose eastern Ebola river gave the deadly virus its name when it was discovered there in the 1970s, and the outbreak comes less than a year after the one that killed eight people. The health ministry said: “Our country is facing another epidemic of the Ebola virus, which constitutes an international public health emergency. Ebola is believed to be spread over long distances by bats, which can host the virus without dying, as they infect other animals with which they share trees, such as monkeys. 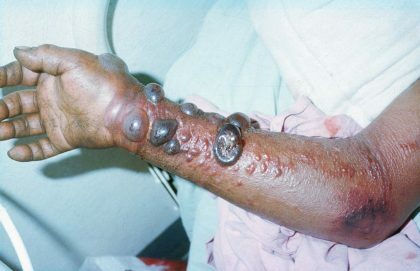 Ebola often spreads to humans via infected bushmeat. Before the outbreak was confirmed, local health officials reported 21 patients showing signs of hemorrhagic fever around the village of Ikoko Impenge, near the town of Bikoro. Seventeen of those later died. Medical teams supported by the WHO and Médecins Sans Frontières were dispatched to the zone on Saturday and took five samples from suspected active cases. Two of the samples tested positive for the Zaire strain of the Ebola virus, the ministry said. After DRC’s previous Ebola flare-up, authorities approved the use of a new experimental vaccine, but in the end did not deploy it owing to logistical challenges and the relatively minor nature of the outbreak. The worst Ebola epidemic ended in West Africa two years ago after 11,300 people and infecting about 28,600 across Guinea, Sierra Leone and Liberia.